Q 1: A pair of opposite sides of a cyclic quadrilateral is equal. Prove that their diagonals are equal. 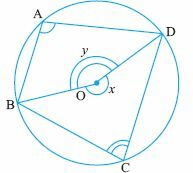 Q 4: PQRS is a cyclic quadrilateral whose diagonals intersect at A.If ang SQR = 80o, angle QPR = 30o, find angle SRQ. Q 8: Prove that the exterior angle of a cyclic quadrilateral is equal to its interior opposite angle.